Keri Hilson: RIP Heavy D. Glad I had the pleasure of meeting you. In your words,”I got nuthin but love for ya.” Prayers to his family & friends. Swizz Beatz: Wow life is 2 short i am twisted about my brother The Great Heavy D 🙁 R.I.P this is wack!!! John Legend: I’m so sad about Hev. He really was a wonderful person. LL Cool J: May GOD embrace the soul of Heavy D and Bless his family. I respected you Heavy and I always will. Ciara: RIP HEAVY D! He was a really nice man! Sending my condolences to him and his family! Tyrese: Live your life to the fullest… Everyday!!! It’s arrogant to believe the next second belongs to you…. @HeavyD a true class act RIP..!! Fat Joe: R.I.P 2 HEAVY D I LOVE U ALWAYS LOVED U MY IDOL!!!!!!!! Brandy: I am shocked, overwhelmed, and all of the above at the death of @heavyd ! May you rest in peace!! I love you and I promise to live INSPIRED! Boyz II Men: UGH…heavy d..always cool as hell with us..just a sick feeling….praying for his little daughter and family. ?uestlove: Damn man. This is a wake up call like a mofo. Heavy D was a good friend & he’ll be missed. Night I met him is funniest story ever. Game: Last tweet of the day: Rest In Paradise to a GOOD FRIEND & legendary hip hop icon Dwight Arrington “Heavy D” Myers. Damn life sometimes !!! Rev Run: R.I.P to one of the best rappers who ever Did it @HeavyD You will be missed tremendously! Nas: RIP TO A REAL HIP HOP LEGEND HEAVY D! 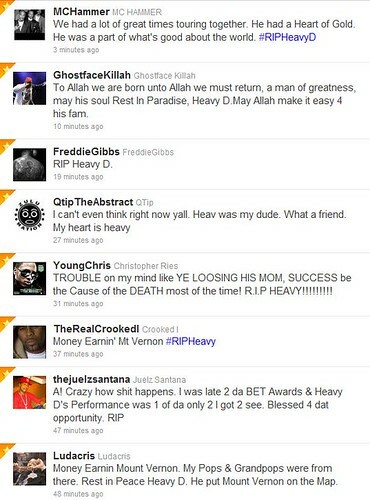 Lupe Fiasco: RIP Heavy D…God Bless!!! Estelle: RIP. Heavy D. i can;t believe that. I can’t. Was just in London w him. WTF.